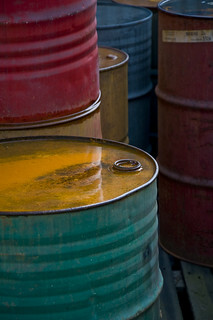 Photo: Colorful Old Oil Barrels by L.C.Nøttaasen. I have yet to get used to thinking in Liters/100km for gas mileage here in Canada. Miles per Gallon (MPG) is simply engrained in my head. Part of the problem is just the difference in units of liters and gallons. But, there is also the issue of one measuring distance on 1 gallon, while the other is measuring the quantity of fuel over a distance. To top it off, they run inverse of each other. (ex: a car that gets MORE MPG is better, but a car that uses LESS liters/100km is better.) Anyway, it threw my brain for a loop while I was car shopping several months back, so I looked around the Internet for a conversion calculator or chart. I could only find one for UK gallons (which I didn’t catch for a while, which REALLY confused me for a bit). Calculators weren’t very convenient while car shopping, so I decided to make a nice chart to take along. If you are also struggling with this one way or the other, enjoy!